And, given that both companies were willing to include tubes, a non-semiconductor technology, why did both omit the most important random-access memory prior to semiconductor memories, the core memory? Core memory was the basis for all computers and minicomputers for most of the 1960s and 1970s. There are several alternative memory technologies that didn’t make the list, and some of these have shipped in respectable volumes. MRAM and PCM have both shipped tens of millions of units, and FRAM has probably shipped in hundreds of millions of units. Both plated wire memories and core rope memories enjoyed limited success and were chosen by NASA for use in various satellite programs. But these are small numbers compared to the billions of DRAMs and NAND chips that ship every year, so their omission may be justifiable. Maybe I am too picky, but I found it a little disturbing that Micron used a photo of a dual pentode, a component of radios and televisions, instead of showing the Williams Tube or the Selectron that they were probably referring to. The Selectron has many more pins and a very unique look, and the Williams Tube resembles a television picture tube since it uses a steerable electron beam, or “Cathode Ray” and works the same way as the Cathode Ray Tube (CRT) that was used as the picture tube in all television receivers and computers in the 20th century. Now, Intel & Micron may have left all of these other memory types off their lists out of neglect, or perhaps they threw their timelines together in a hurry, but you have to wonder if they wanted to keep the number of technologies as low as possible to make the introduction of 3D XPoint more impactful. 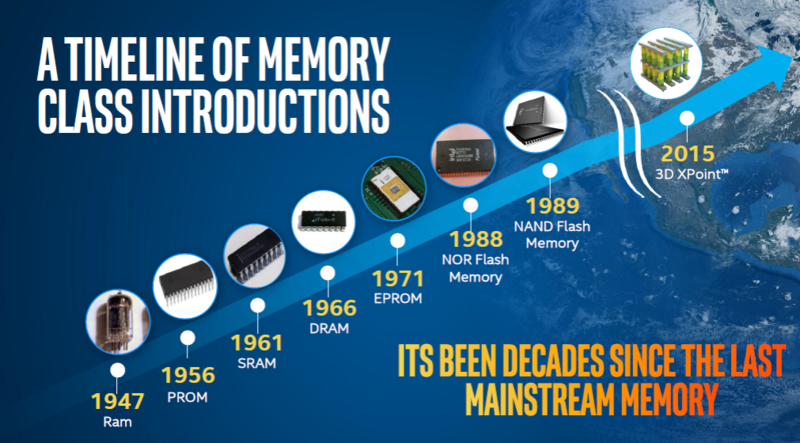 An interesting point is that many of these technologies were either invented or first shipped by Intel, namely SRAM, DRAM, EPROM, Bubble Memory, and NOR flash. 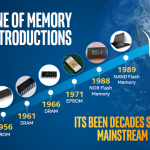 Intel has introduced and ramped a number of memory technologies over the years, including EEPROM, later abandoning each market when it attracted numerous competitors and became unprofitable. No matter what, the memory business has a rich history, and it’s puzzling that some important technologies were left off these companies’ lists while less important ones were included. 7 Responses to How Many Kinds of Memory Are There? Delay line memory? Remember seeing a calculator that used it. Yes. I didn’t go there. The Computer History Museum in Mountain View, CA, (http://ComputerHistory.org) has a number of mercury delay lines, and possibly some other types. It must have been really tricky to use these. Quite ironically, the mercury in these devices is very likely to have been mined in nearby San Jose, home of the world’s largest mercury mine at the time (New Almaden). I also neglected magnetic drums, which may have counted either as memory or storage. Despite any claims that Intel may make regarding having invented EEPROM, I’m pretty sure other companies did so earlier. Wikipedia claims that Eli Harari at Hughes Aircraft invented the EEPROM in 1977, but NCR developed an MNOS (not a typo, Metal Nitride Oxide Silicon) EEPROM (at the time called EAROM) which they put into production in 1976, and I purchased and used them in 1977. I think General Instruments also offered MNOS EEPROMs before 1978. There’s not much information about MNOS EEPROMs online, so I’m not sure whether they used Fowler-Nordheim tunneling. Addendum: According to _Computerworld_ of September 17, 1975, page 31, NCR was already manufacturing MNOS EEPROMs in 1975, using them in their own products, and had already licensed the technology to General Instruments and Mitsubishi. Eric, you are right. Other folks have corrected me offline telling me that Intel never actually produced any EEPROM. Intel most definitely did produce EEPROM, such as the 2816 2Kx8, introduced in 1980 or 1981. I wrote the version 2 software for the Apparat “PROM Blaster” for the Apparat “PROM Blaster” for the Apple II, and got samples of the 2816 and supported it in the software. The 1981 Intel Component Data Catalog also lists the 2808 and 2809 1Kx8 parts, which were half-good 2816s, but I’m not sure whether they actually sold those. They later added the 2815 and 2817 2Kx8 parts, with the 2817 being somewhat easier to use. I think they continued developing and producing EEPROMs at least until the 64Kbit stage. It appears that other vendors were generally more successful at commercializing EEPROMs. 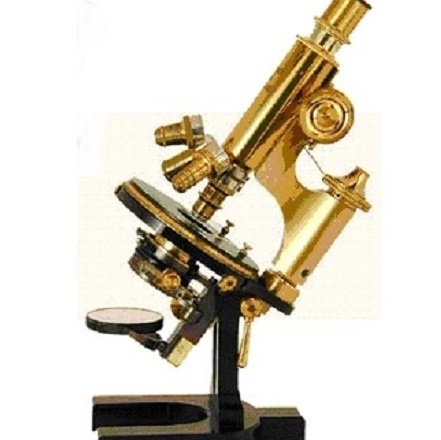 The MNOS parts from NEC and General Instruments tended to have really complicated voltage, waveform, and timing requirements. The Intel 2816 was functionally a lot more similar to a contemporary EPROM; it did need Vpp and program pulse timing, but it wasn’t too complicated. Later generations of parts introduced self-timed programming, but it wasn’t until the late 1980s or early 1990s that EEPROMs that didn’t need a special programming voltage started appearing. It’s possible that Intel may have been first to invent the floating gate EEPROM, if the earlier MNOS EEPROMs (EAROMs) worked by a different principle. Certainly floating gate technology has been the mainstay of nonvolatile memory to this day, with FRAM, MRAM, BCRAM, etc. making some inroads in relatively low-capacity devices. OK. I was wrong twice. Bad record! In the long run, though, the question remains: Why wasn’t EEPROM mentioned when Intel and Micron listed the history of memories? Sounds like you’re quite the EEPROM expert!